1975: The Giants finished third and the Padres fourth. 1976: The Giants finished fourth and the Padres fifth. 1977: The Giants finished fourth and the Padres fifth. 1978: The Giants surged back up to third, the Padres barnicled to their hull in fourth. 1979: The Giants fell back into fourth, shoving the Padres into fifth. 1980: The Giants plummeted to fifth, using the sixth-place Padres to cushion their fall. I figure this season-in, season-out, caste-system clumping of the two mediocre teams is one reason why I have always associated them, others lesser reasons probably including the fact that they were both about as far away from me as possible and both began with the word “San.” Because of this association, I have long had the belief that players were constantly shuttling back and forth between the two teams. This belief gained strength in the late 1980s, when, because of hallucinogenic drugs, literary pretensions, and certain painful events occuring in Shea Stadium in October of 1986, I was at a particularly pronounced remove from my former childhood religion of baseball, and so had trouble keeping track of whether Craig Lefferts was a Padre or a Giant. One minute he seemed to be on the Padres, the next the Giants, and the next back where he’d seemed to have been in the first place, my confusion based in part on the actual trade that brought him from one team to the other but also because I was mixing him up at various times with Scott Garrelts, Greg Harris, the other Greg Harris, or Greg Minton. Anyway, despite whatever the actually reality of the situation was, I have for many years dimly pictured a glum brown and yellow bus with orange stripes dedicated primarily to the constant plodding movement of players up and down the California coastline from one fairly desolate N.L. West situation to another slightly less desolate N.L. West situation, or vice versa. This conceit may have been given fuel by the unfolding story in my baseball card collecting days of Derrel Thomas, who was among my earliest cards as a Padre, then was a Giant for some years, then was a Padre again before briefly disappearing from view. In truth I had just failed to get his card in any of the packs I bought that disappeared year, but if I’d thought about the absence, which I probably didn’t, I might have hypothesized that Derrel Thomas had opted to retire rather than take yet another ride on the brown and yellow and orange bus. Instead, he had found an even better way to free himself from being the square blip drifting back and forth across an otherwise blank screen in the Sisyphusian Padre-Giant game of Pong. I imagine that such a scenario of escape as his–to the sky blue Dodgers, perennial chisel-jawed contenders for the N.L. West crown–had been spoken of often but without much hope on the brown and yellow and orange bus, like Ratso Rizzo wheezing and coughing and dying as he impotently dreams aloud of someday making it to Florida. Well, Ratso Rizzo may have never made it to his land of milk and honey, but Derrel Thomas did. Here he is in one of the last cards of my collecting days, on the brink of being a 1981 strike-year (hence at least partially asterisked) champion. He seems alert, slightly apprehensive, and a bit haggard, as if he’s spent most of the last decade sleeping lightly on long, seedy busrides with his duffel bag on his lap and a boxcutter gripped in his fist. 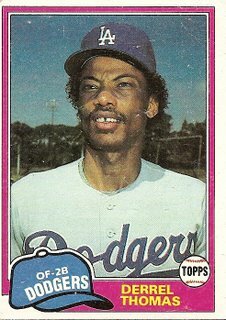 This expression and the odd combination of positions listed on his card–“OF-2B”–suggests to me that part of the reason he was able to escape the brown and yellow and orange abyss was that he made absolutely sure the Dodgers knew he’d do whatever it took for them to give him a chance. If Derrel Thomas’s escape from the Padres-Giants suggest an alternate, happy ending to Midnight Cowboy, the events that must have enabled that escape suggest the beginning of another film from Hollywood’s golden age, a film I for some reason keep returning to whenever I meditate for long on the Padres and Giants of the 1970s . . . Personnel Officer: Wanna work uptown nights? South Bronx? Harlem? Travis Bickle: I’ll work anytime, anywhere. Personnel Officer: Will you work Jewish holidays? You are currently browsing the archives for the Derrel Thomas category.